Where: Usually at road works for temporary traffic control. Purpose: These are two different signs, which are mounted back to back. It indicates whether you may proceed or must stop. 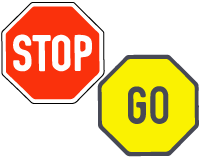 Action: Stop if the STOP sign is displayed and move off or proceed with caution if safe when the GO sign is displayed.